Without any confusion, yes, HEC Entry Test is also known as ETC Entry Test for intermediate students to get admission in many universities. It's worth mentioning that you can't apply with the same User ID and Password for the Phase 2 ETC Entry Test that you applied for the Phase 1. First, this test is for the students of Pre-Engineering and Pre-Medical students as the previous one was for all the students either they are of commerce or computer science etc. Second, the URL of HEC/ETC Entry Test 1 is eportal.hec.gov.pk whereas HEC/ETC Entry Test Phase 2 is etc.hec.gov.pk. Different URLs, so different databases. This test will be valid for medical colleges and engineering universities. Go to ETC Portal, and click on Register. Because you don't have an account on it. Keep in mind, if you created an account during Phase 1, then THAT ACCOUNT will not work here. Now, select your nationality, and write your CNIC. Don't worry, if you don't have the CNIC, then you can write the B-Form detail. In case your B-Form is not valid, then you can go to NADRA to verify. Because HEC and NADRA databases are connected with each other. When you write the number, and click SEND CODE, a code will be sent to your mobile that you have to write. Then click VERIFY button, otherwise it will not work. The code will be sent to your email provider that you have to write. Then you have to fill the personal detail, your name, upload the photo, and father's CNIC. When you click Choose File, and select the passport size, it will be uploaded automatically rather you have to click UPLOAD, then it will upload. Even if you don't have a blue or white background image, then you can place any other image in which your face is visible. It will work. Why am I saying this? I applied with an image as shown above, I received the ETC Roll Slip. Then you have to provide the permanent address according to your CNIC or B-Form.You can write the mailing address where your ETC Roll Slip will be sent via TCS. Now you have to fill the Education Information of SSC and HSSC. Where you did you study your school and college. Filling Day and Month for SSC and HSSC is not important. The important thing is the year when you started your SSC and when you ended SSC. If you did 9th Class from one city and 10th class from another, then the data of 10th is important. If you did O or A level, then select IBCC. Then click Apply for Entry Test from the category of ETC Entry Test. Select your Test Category. Please! Please! Please! Check everything before applying. Thousands of students filled wrong, then they feel sad. Some fill wrong date of birthday, total marks and registration number. 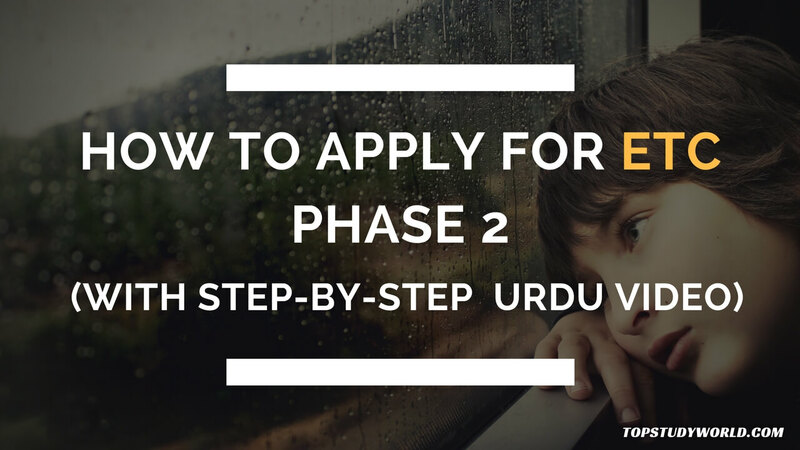 Here is a step by step guide with an Urdu video how to apply for ETC (HEC) Entry Test for Phase 2. You will not find the best article than it. We explain the best.